I have been increasingly anxious over the past week, as I grew closer in my pregnancy to the 21-week mark where I lost Nelle. On Wednesday I told my therapist that I had crippling fears over losing the baby or that something was wrong. She wanted me to tell myself “Stop it” to which I responded that I couldn’t, because I did not believe that everything was ok. She told me to try saying “I can get through anything.” To which I responded that I was not sure about that either, because if something was wrong, how much can one person handle? On Thursday and leading up to my appointment on Friday, I was so distraught that I could barely get out of bed. Turns out, my instincts were right. I went in for my 2:00 appointment on Friday with my favorite doctor in the practice. The nurse wanted to use the doppler monitor to listen for the heartbeat, but I insisted on an ultrasound with the doctor, citing that the doppler made me too uncomfortable because of my last appointment with not finding a heartbeat right away. The doctor came in and asked if I had any reason to be concerned, like cramping or bleeding and I said no, I would just feel more comfortable using the ultrasound for a quick answer. He looked for a few minutes and then said “I do not want to have to tell you this, but I don’t see anything.” I completely broke down in the room. I was alone with that news, again, since being a regular appointment, Ger was not with me. The doctor knelt beside me and gently said that he needed to send me to the Maternal Fetal Medicine department at the hospital to confirm, and then said “I desperately hope that I’m wrong, but I’m not going to lie to you – I’m probably not wrong.” He offered to walk me to MFM. I had to wait 45 minutes for the confirming ultrasound, but they graciously put me in a separate room so I was not in the waiting room. By that point I was not expecting anything other than the confirmation I received – that there was no heartbeat. The MFM doctor told me that everything on the ultrasound looked fine. Unlike Nelle, who was growth-restricted and measuring 3 weeks too small, this baby was within four days of due date (likely the day that we lost her). She told me that my options at 16 weeks pregnancy were surgery, but they did not do that type of surgery at the hospital here – I would need to go into Chicago. And could not be scheduled until Wednesday, since they would not schedule over the weekend, Monday was a holiday, so I could call Tuesday for the Wednesday appointment. Or I could go through labor and delivery again, which would be a longer process but could start immediately. Recovery time the same, but if we wanted answers through any placenta testing or autopsy, then we needed to do L&D because there could be damage through surgery. I opted for L&D to start right away, and also to be with doctors that I knew. So I headed over to the L&D ward and Ger met me there. Someone from the lab came in and took vials and vials of blood, in hopes of getting some answers. It was mercifully a shorter process, 14 hours versus 26. One of my friends stopped by for several hours to stay with me while Ger ran home to take care of some things. My brother and his girlfriend were coincidentally on their way to visit us for the weekend, and another friend watched the boys until they arrived. The similarities were painfully ironic, since Nelle was also born on a 3-day holiday weekend. And their sizes were similar with this one being born at 16 weeks 1 day and Nelle being growth-restricted to just over 16 weeks. The admitting doctor was a newer one in the practice and I had not met her, but the doctor scheduled for the following morning was the same one who delivered Nelle. I did not want anything from the hospital to help in the grief. I did not want to look at their pamphlets on losing a child; I did not want to be visited by any grief staff. I could not believe that just over 5 months later, I was going through this exact same, excruciating process again. She was born at 7:42 a.m. and the shift had not changed yet, so it was the admitting doctor who did the delivery. She immediately commented in a low voice to the nurse that the umbilical cord was wrapped tightly around the baby’s neck, twice. Thankfully, I did not need a D&C this time. Once everything had settled, I asked her if that was indeed what I had heard and she confirmed yes, and that she believed that was the cause of death. I had been wracked with guilt that something was wrong with me – something undetected, that had caused both losses. But hearing that it was an unrelated complication was almost worse. Ger commented that it was like getting struck by lightning, twice. We had to wait for hours to be discharged. Even hours after the epidural wore off and I was able to move around the room effectively by myself, I had to wait for the discharging doctor to come in and the nurse had to make sure everything was put together for me. The discharging doctor, the one who had delivered Nelle, said that he was in disbelief over what had happened to us. I will admit that I asked for a prescription for an anti-depressant. The anxiety over the past few weeks had been near-debilitating and I was afraid that this would push me over the edge. The hospital sent home a box of mementos again, along with stuffed bears for the boys and books for the boys. Today I am numb. I have moments of intense grief, but I am also undeniably in shock. And angry, which is a new emotion for me in the grief process. In September I was so profoundly sad, but now I am angry at the unfathomable unfairness of this happening again, for a seemingly unrelated reason. Google tells me that umbilical cord complications are rare. Just like the possible cause of Nelle’s death with a blood clot is rare. Two rare complications and I got them both. It bothers me that this will be classified as a “miscarriage” whereas Nelle was a “stillbirth” being after 20 weeks. I don’t know why it bothers me so much, but it does. They were almost the same size, and the delivery process was identical. I feel that somehow she is not being recognized in the same way because of the different classification. Her name was Iris Madeline Hnub Yang. 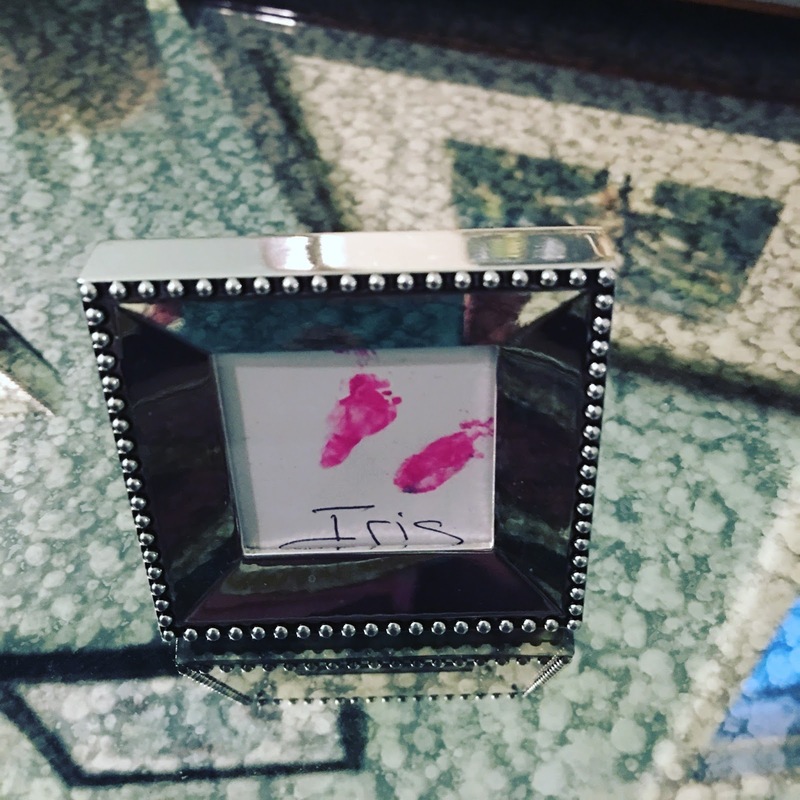 Iris is the Greek word for “rainbow” because she was supposed to be our rainbow baby after the storm of losing Nelle. Ger picked Madeline and on many literary levels I thought that this was perfect. Hnub is the Hmong word for “sun” to go with our other children: Huab – cloud (Theo), Teb – earth (Quentin), and Dej – water (Nelle). I have another set of footprints for my second daughter. Ger commented that now Nelle will have a sister to play with, always.